Vinyl windows prices can be anywhere from $200 to $700 per window - this price is for both the installation and product. The price obviously is determined by the type of frame you choose, the features you select, which glass package you want, the manufacturer and the size of the window. Other considerations include whether it's a straight replacement or whether there is additional work that needs to be carried out in order to install the window. For additional costs and pricing, use our project calculator. Entry level products can range in price from $125 to $250. You often find these entry level products at places like Home Depot and Lowes. In the majority of cases these will come with clear or low end low-e glass packages, plastic hardware, no frame reinforcements or frame fills, and a very limited selection of frame colors and finishes. Basically they will be a stripped down window - hopefully the design and construction are good enough that these won't cause problems. We recommend consumers try to get a mid range option from most vinyl window manufacturers for the best long term value. Standard or mid range vinyl windows vary in price between $250 and $350 per window. These are often made by mid-range manufacturers offering good quality products. The standard windows are often available in a number of styles from double hungs to awnings and casements. They will offer a middle range glass package which may have some energy efficiency features such as low-E glass, krypton or argon fills, U and R factors which are considered good. As you move up to the higher end vinyl windows, the costs will be between $350 and $450 and will be offered by one of the top window manufacturers. You can expect energy efficient glass packages with low U and R values, super spacers, foam insulation and a krypton fill. High quality hardware will be used to ensure the window is durable and there will be a good selection on styles including bay, bow, palladian and casements. The installation costs on vinyl windows range between $40 and $250 per opening. The prices listed are based on a per opening price. This lower end window pricing includes the windows and installation. 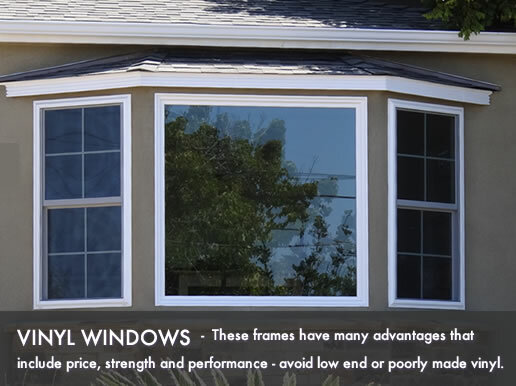 This mid range window pricing includes include the windows and installation. This upper end window pricing includes include the windows and installation.